Anyone for “Bunyip Adventure“? 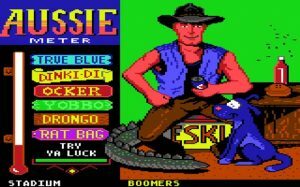 What about the virtual Mick Dundee in “Aussie Games“? Did anyone actually play these games, or was making them just a necessary part of maturing the new computer games medium? Were they actually good games, beyond their hilarious Ocker references? I rather think I fancy a game of “Emu Joust“. 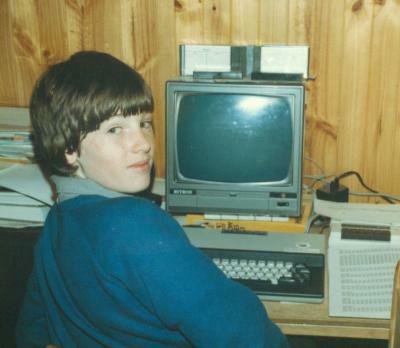 Emu Joust was one of the favourite games of me and my family back in 1984 playing on the mighty Microbee. It took a while to load in from the tape, but once loaded, you could turn the Microbee off and back on the next day and it was still there as it had battery backup for the memory. I loved Defender, but the kids loved Emu Joust. They played it for years, but as the Microbee was updated to a Floppy Drive Computer-In-A-Book, it was quicker to load and I think they played it even more. I cant remember what level they got to but I dont think they ever got to the end. Picture was taken in Feb 1984 with my son Scott playing Defender (can just make it out in the screen). Fabulous photo Alan! There’s something about these game names…I know they’re probably in the minority but today I came across a game by Adrian M. Streeter called “Mozzie Zapper” (1987) for the C64, which is also very appealing in a local sort of way (http://www.gb64.com/game.php?id=12300&d=30). Has anyone played this? Any other memorable game names/themes/memes? I also have fond memories of playing Hoards of the Deep Realm. You could even make your own levels!! A few more that I played as a kid that come back to mind after searching for Microbee on youtube….